In the last few weeks, beginning with the saga of the captured US stealthy RQ-170 drone and ending with the crisis in the Strait of Hormuz, with the alleged video of the U.S. aircraft carrier Stennis taken from an Iranian Fokker 27, I’ve often discussed about the authenticity of the footage released by the Iranian State TV or news agency, with the readers of this blog. In the past, the Iranian propaganda machine has used doctored videos and fake images to spread its messages and this is the reason why many are doubtful each time new images showing Iran’s military achievement surface. However, the one I’m posting below was just uploaded on Youtube (date is Jan. 1, 2012) and looks like it is authentic. It shows an Islamic Republic of Iran Air Force (IRIAF) F-5E performing a nose-gear-up landing at Dezful airbase also known as Vahdati Air Base, in southwest Iran. The aircraft comes to a stop thatnks to the dragchute and, later, we see the pilot unhurt near its plane. Actually, we can’t be sure whether the nose gear failed to come down or it collapsed after landing: the fact that someone was filming it (from a dangerous position) suggests the emergency was known before the aircraft landed, still, ground personnel seems to be unprepared to the management of the emergency, with people and cars initially rushing towards the plane and then coming back. 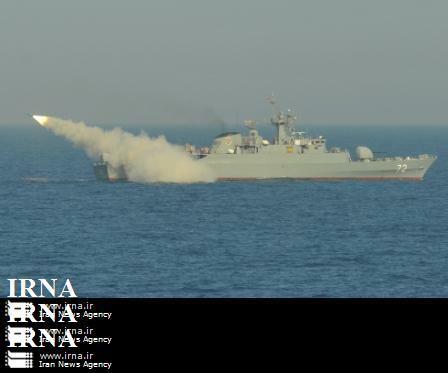 Dealing with the news, on Jan. 2, the IRNA news agency has published another picture, this time depicting the coast-to-sea long-range missile, named the Qader (Capable), with a range of 200 km and capable to target destroyers and battleships. Delivered to the Navy in September 2011, the Qader is believed to be the most powerful missile of the Iranian Navy. A short-range Nasr (Victory) cruise missile with the capability to destroy large vessels, and a surface-to-surface Nour (Light) “ultra-advanced surface-to-surface missile” were fired by the Iranian naval forces in the last phase of the Exercise Velayat-90, as well as a surface-to-air medium-range smart missile, named the Mehrab (Altar), equipped with anti-radar and anti-jamming systems. To be honest, mainstream media have all broadcast the same image, with different captions, so my guess is that the one in this picture is the Qader, even if it might be a Nour (as affirmed by the IRNA website…wasn’t the Nour a surface-to-surface missile?). Landing a Rafale an aircraft carrier. At night. A video shows why a night trap is the scariest and most demanding kind of flying.